Summer and popsicles. That’s the way life should be lived. 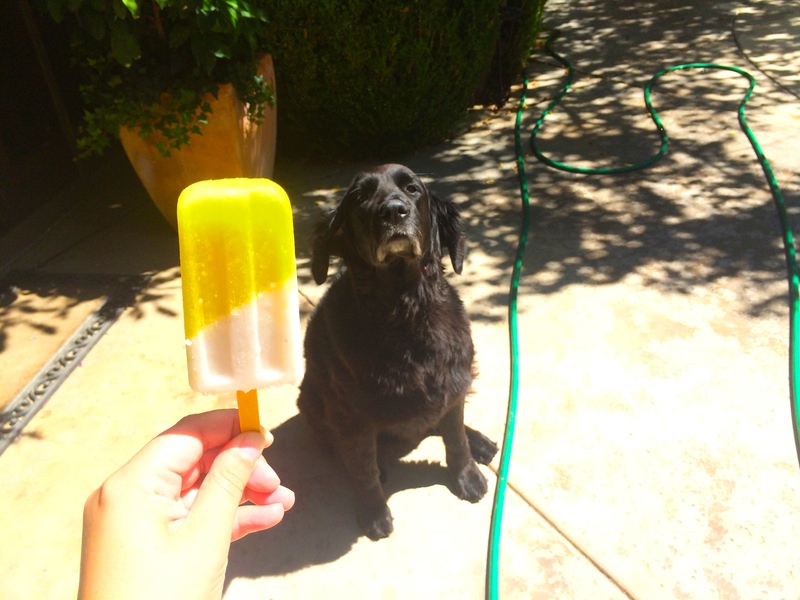 Even in sticky, 104º weather, popsicles have a power to solve problems. These little creations, adapted from A Cozy Kitchen’s Mango Cardamom and Sweet Coconut Popsicles, are wonderful for hot days like these, and even look good while cooling you off. And even if you can’t be relaxing on a tropical beach somewhere (which I most certainly am not), just close your eyes and relax with a pop, and bam! you’re there. Okay, maybe I didn’t create a teleportation device, but it’s as close to the tropics as I can get for now. I played around with the original recipe just a tad, substituting pineapple instead of mango, for a different flavor but still delicious. They’re incredibly easy to make, but require patience for the freezing time – and maybe borrowing your best friend’s time and popsicle molds (thank you Cat) – but they are so worth it! Core and cut up the pineapple into chunks to fit in a blender. Add the orange juice, ¼ cup sugar, and pinch of salt and blend. Strain the mixture to take out the bits of unwanted core, making sure to push the pulp around to get as much out as possible. Pour pineapple mixture into molds until half way up, tilting mold on a ramekin to get the geometric design. Freeze for two hours. Mix the coconut milk, cardamom, shredded coconut and ⅓ cup sugar until sugar dissolves. Pour mixture over the frozen pineapple, removing ramekins, so the mold stands up. Place popsicle sticks in the molds, making sure to reach the pineapple layer for sturdiness. Freeze for two more hours and release by running hot water on the side. Enjoy and maybe share a bit with peering eyes like Ella because the puppy dog eyes take no prisoners. It’s been just over one month since I started this blog and attempted to understand everything about the internet world that goes along with it. Woah, a whole month! *Yay! Bravo! * In the past month I’ve noticed that this blog thing is basically people expressing themselves through these little posts and then starting conversations with those who feel the same way – and that is great! Because even though our world has been technologified (yes, I just created that word), the art of conversation seems to be present in a new way. So, in effort to keep the conversation going and expanding the blogging world, here are a few things about me. A big thanks to the lovely Carolyn who nominated me for the Liebster Award and to answer these questions! I decided to start this in effort to keep family and friends updated on my travels this upcoming fall, however I have always wanted to create a food blog and this seemed like the perfect time. Plus, it’s an excuse to try new recipes and get up a travel a bit more! 3. Favourite place to shop? I love Zara, Jcrew, Madewell – basically anything that sells comfortable clothes that make it seem like you know a little something about fashion. 4. What’s your go to comfort food when you’re ill? My mom’s slow cooked applesauce with all the glorious apple pieces can solve any issue in my life, big or small. 5. If you could road trip around any country where would it be? I sometimes forget that the United States is so massive and filled with beautiful scenery, so a road trip around the borders would be wonderful and definitely do-able! 6. If you could have a meal with anyone famous (dead or alive) who would it be and why? I would love to share a meal with the amazing Jane Goodall to learn more about her passion for preservation and how she grew awareness for a vital cause. 7. What is your favorite musical experience (i.e. concert, festival)? Last year I attended Outside Lands in San Francisco with my whole family and it was filled with dancing, delicious food and lots of fun. We listened to Paul McCartney, Vampire Weekend and introduced my parents to Zedd – all together a great trip. I’d like to nominate: Slowboat, A Collection of Adventures, SuzieWho, The Trip, Fifi’s Looking Glass and Steph Eusebi to answer these questions, so we can learn more about each other and bring the blogging world closer! The rules are to 1) thank the blogger than nominated you, and link back to them 2) answer the questions they sent you 3) nominate bloggers with less than 200 followers to answer the questions 4) notify the bloggers you have nominated them. Thanks again for sticking with me this past month guys! Even if you weren’t nominated, answer one of these questions in the comments, and let’s get the conversation started!